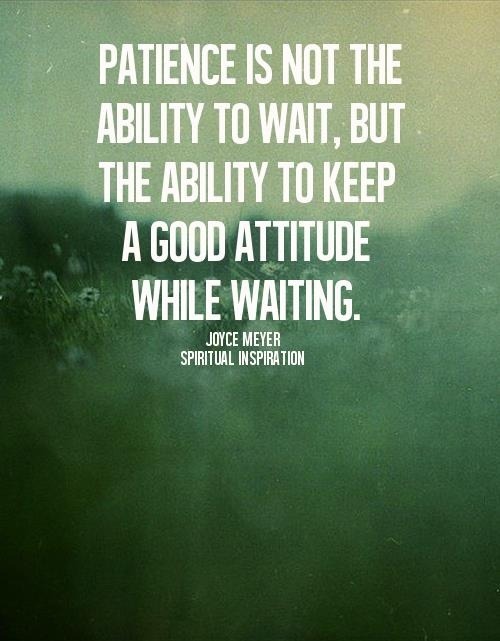 Why is patience so important? Because it makes us pay attention. Time has no meaning, Love will endure..
Don't give up on the plant that looks dead... it may be that it's just not yet in season. It is very strange that the years teach us patience - that the shorter our time, the greater our capacity for waiting. An alternative to love is not hate but patience. Inner peace is impossible without patience. Wisdom requires patience. Spiritual growth implies the mastery of patience. Patience allows the unfolding of destiny to proceed at its won unhurried pace. Patience is a fruit of the spirit that grows only under trial. It is useless to pray for patience. Well, actually I encourage you to pray for patience, but I'll tell you what you'll get TRIALS!